Sharing your healthcare data safely – public views on using patients’ medical reports, letters and doctors’ notes for research? To improve current research using free-text data, we need to find a way to make them more accessible and, simultaneously, to do this in a safe, secure way. Several use MY data members took part in this event which sought to engage all stakeholders to check that safeguards and governance frameworks are trustworthy and meet all the expectations of the public. use MY data representatives were in the audience, at workshops and on the main discussion panel. A member of use MY data presented at the annual training event for NCRAS staff. The presentation was from a personal perspective, highlighting a personal "data journey", including feedback on what the member found when he examined his own data record. use MY data were taking part in a session within an all-day King’s Fund event – Health and care explained: how the system works and how it is changing. The event examined how data is used in the NHS (for evaluation, research, improvement, direct care etc.) and how that is changing, along with a brief background on Information Governance, GDPR and the National Data Opt-out. A use MY data representative talked about use MY data and what we do, giving their views on some of the points above. use MY data had a joint exhibition stand with Cancer52. Our focus for the day was on "The patient and carer voice", continuing the work of use MY data and Cancer52 in ensuring the voice of people with rare and less common cancers is heard alongside those with the more common cancers. We used the event to do some short filming of patient views, in partnership with Cancer52. The films will be available shortly. The workshop examined the latest patient data initiatives and how (or whether) the patient voice is being incorporated into these. - Do we need opt-outs, active data donation or just a new NHS social contract? - Auditing your own health record - how, what, why? - GDPR, Common Law, Consent. Where are researchers struggling and how could the patient voice help? Delegates heard the latest thinking from experts on different aspects of the uses of patient data. They also heard about some of the challenges and were asked for their thoughts and suggestions throughout the day. The workshop was interactive and discussive and was an opportunity for delegates to feed their views directly into several developing areas. The workshop was aimed at patients, relatives and carers, the public and professionals. It was open to all who are interested and was free to attend. Expenses were covered for delegates who are patients, relatives and carers. A summary report of the workshop agenda is available here. Can Data Volunteering, Data Donation and the National Data Opt-out empower citizens to optimise data use? We have organ donation, but not data. Why? Auditing your own health record - how, what, why? What is proposed, what are the plans, and how do you get involved? GDPR, Common Law, Consent - where are researchers struggling and how could the patient voice help? use MY data members attended, sharing a stand in the exhibition hall with Cancer52. Our joint focus for the event was "the patient voice in data", showing how use MY data and Cancer52 are working together to help ensure the voice of people with rare and less common cancers is heard. We also used the stand to promote the data animations produced by Understanding Patient Data, which use MY data were part of developing. We had details on the stand of the launch of a new national award, led by patients/carers, to showcase examples of excellence where data from the National Cancer Patient Experience Survey has been used to drive improvements in patient experience. We encouraged the continued use of the use MY data "data citation", which has been adopted by Understanding Patient Data and which organisations are being encouraged to use. 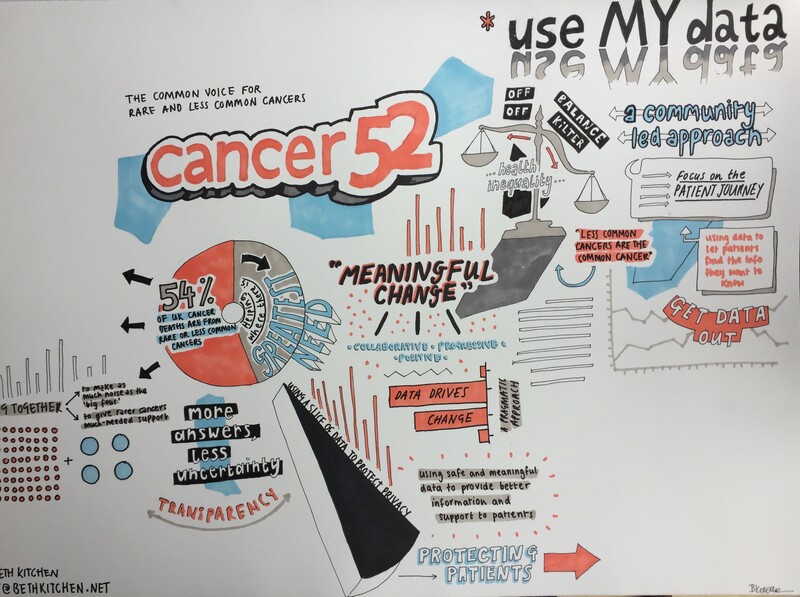 During the course of the conference we used a graphic artist to produce two illustrations, one per day, on the separate themes of "the patient pathway" and "rare and less common cancers". These illustrations are available for members to use freely. Delegates heard from experts on how patient data is being used, how patients are being involved, what safeguards are in place and, how patients can play a stronger part. use MY data were invited to give a keynote speech at the Annual Conference of the Association of the British Pharmaceutical Industry, followed by use MY data taking part in a panel session. GPs receive no formal training about data & yet statistics show that GPs are the first point of contact for patients seeking advice about whether to opt in or out of their data being used. With clinical time constraints, is it actually possible to explain to a patient all of the potential rewards and risks of their data being used? If it is not possible to explain, how can a patient make a truly informed choice? The Government’s response to the National Data Guardian’s recommendations about the new National Consent Model state “we will support professionals to implement the national opt-out successfully”. Given that the GP practice is one of the main places for patients to have conversations about their health and about the uses of their data, this session will discuss issues such as the lack of training and materials for GP staff and the risk to the continued use of data for analysis and research. In this session we heard about what is being done to help GP staff in this area, examined what more needs to be done and how best this might be achieved. Attendees discussed the current status of the proposed National Consent Model and how patients can work with GPs to better understand the rewards and risks of data sharing. The session summary is available here. 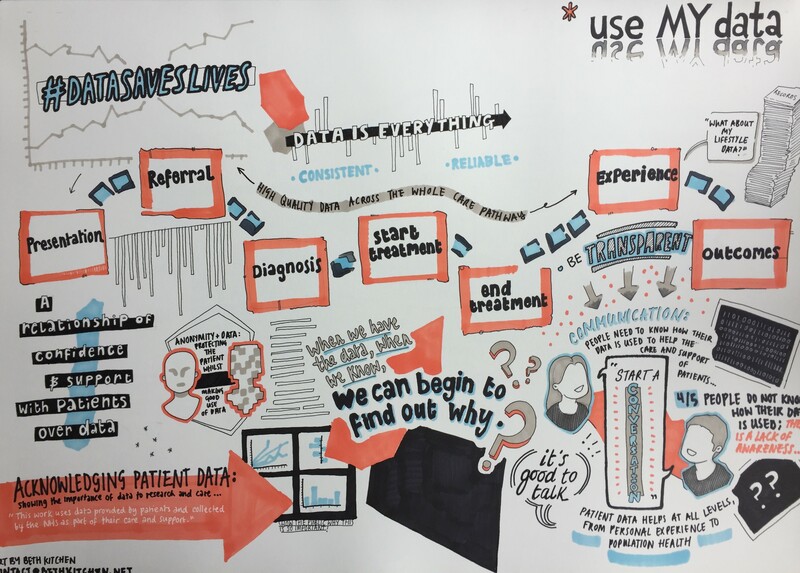 The use MY data workshop, Commercial uses of patient data, took take place on Thursday, 12 October at the offices of Quntiles IMS in London. During the workshop we examined, via a mixture of talks and discussion, the ways in which commercial use is made of patient data. - which commercial companies can obtain your data? - what are the controls around commercial access to patient data? - what levels of data can commercial companies see? - what do commercial companies do with patient data? - how do commercial companies benefit from patient data? - how does the NHS benefit from commercial use of patient data? How are patient data used to provide the insights and evidence that the NHS needs to deliver and evaluate services to provide better outcomes for patients? How does a commercial company support the NHS and pharmaceutical industry in conducting clinical trials and real world evidence studies in disease areas? How does the pharmaceutical industry use patient data (part 2)? Openness and transparency - could it be improved? What do patients want? The conference provided a national focus for access to patient data. It explored how data is being used across the patient pathway, from prevention, early diagnosis and treatment through to patient experience, quality of life and patient outcomes. Data - How can patients make an informed choice if we can't inform them? We now have between 1 and 2 million people who have "opted out"of having their data shared outside of their direct care. They made a choice. But with so much emphasis on choice being "informed", exactly how well informed were patients when they made that choice? A workshop took place in January 2017, organised by use MY data, to bring together a panel of GPs with cancer patients, some of whom had opted out of care.data, and some who had not. 1) When care.data "hit", what did the GP community have available by way of briefing, and what did they know (or find out) about patient data, so that they could advise any patient who asked? 2) if a patient were to ask the same question (about data usage) tomorrow, is the GP community any better equipped to answer the question, so that patients can make a fully informed choice. Not unexpectedly, the GP community felt ill-equipped to cope with the questions asked of them by patients about data usage when care.data was announced. However, there seems to have been little or no improvements in equipping the GP community with additional information, balanced assessments of risks and benefits, and other facts to allow them to advise any of their patients about data usage. Any choice is complex. Given the clinical time constraints, is it actually possible to explain to someone all the secondary uses of their data, the potential risks and the major benefits that can be accrued for such data usage? And if it is not possible to explain, how can any patient make a truly informed choice? The findings from the workshop, together with follow up actions and feedback from primary care and patients, and recommendations, were presented and discussed with the audience. Delegates heard from pathologists, patients, researchers and governing bodies. Via a mixture of talks, questions & answers and debate, we examined the benefits of and barriers to donating tissue. The workshop was aimed at patients, the public, researchers, biobankers and charities, but was open to all who are interested. Using and disclosing confidential patient information and the English common law: what are the information requirements of a valid consent? 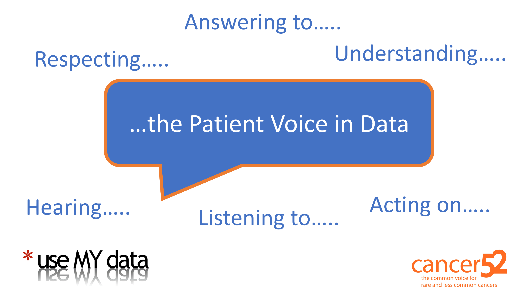 The patient voice - who is listening? This workshop examined the role of the patient voice in relation to patient data, examining how influential the patient voice could and should be. - Can patients control how their data are used? This session examined existing initiatives where patients lead on the use of their data and the impact of this. It looked at potential initiatives where patients want to lead on the use of their data and the potential impact for research and outcomes. - The media & patient data: is the patient voice heard? Via an expert panel this session presented balanced perspectives about the role of the patient voice in the media. We examined how influential the patient voice could be, why it is not heard at the moment and how a more balanced media view of the uses of patient data could be achieved. After an overview highlighting the current issues affecting primary care and data collection, we heard from GPs about how this currently feels in primary care and the ways in which conversations with patients are approached, or why they are not approached. In turn we aimed to provide a balanced patient perspective & voice to aid GPs. Other options for linkable lifestyle data – what about your supermarket loyalty card? What sort of insights could be gained & who would benefit most? This session will set out a proposal for how the patient community can drive the data agenda, so that patient data is collected and used in the most effective way. The session will examine how easy this could be if current & proposed barriers were removed, alongside looking at the safeguards that would need to be in place. It will do this by examining patient led initiatives and using examples from the devolved nations. The session will clearly demonstrate why politicians, the NHS and the public should be accountable to patients and listen to the patient voice. use MY data / ICPV workshop details available here. To explore who uses patient data, why they use it and the benefits and risks of its use. To present the balanced argument for using data, hearing from data privacy campaigners and patients who want their data to be used. Speakers included prominent data privacy campaigners, discussions around the insurance industry and representatives from the pharmaceutical industries. How can/should the media present a balanced view of patient data? To provide a national focus for access to patient data, with media engagement. To hear about the rewards of data use. Organised by the PHE National Cancer Registration and Analysis Service, and in collaboration with the UK & Ireland Association of Cancer Registries. This conference is renowned for its high inclusivity of active patient voices. Patient bursary places are available, and the use MY data team will be at the event and taking part in plenary and parallel sessions. To provide background information, updates and balanced perspectives on the National Consent Model and its implications for data collection and research. Cancer registration – how will it change if consent is needed? How patients are currently informed. Using patients’ experiences to define how new patients could/should be informed? 11 February 2016 Data workshop, London To follow up from the 29.09.15 data workshop, providing information on a range of data issues (requested after the workshop and via the use My data working group). 8 December 2015 Championing a research focused NHS: How should we best use patient data? To explore the current landscape for the use of data in research in the NHS - and the rules in place around access. To generate solutions for how cancer patients, charities and politicians can support the organisations entrusted with our medical records to strike the right balance between protecting confidentiality and enabling effective and timely research. 3 November 2015 Involving patients in the use of their data. NCRI Cancer Conference, Liverpool To bring together the patients whose data is held, with the researchers who need access to this data to drive improvements in diagnosis, treatment, care and outcomes. To explain the difficulties in getting access to data for research, including what has stopped, and where we are now. To explore ways in which the patient voice can to help unblock these difficulties. To describe and help plan a wider programme of activities aimed at education for, involvement of and support from patients for the usage of their data to save and improve lives. 29 Sept 2015 Data workshop, London To help increase the understanding of the collection, ownership and use of cancer patient data, as well as looking at data protection and data access. To aid those who wish to, to promote the use of their data for research. Who can access your data and how? 29 July 2015 Donate Your Data Working Group meeting, London To discuss the aims and methods of Donate Your Data and develop a strategy, addressing patient involvement in data release, recruitment, communications and advocacy. Cancer Outcomes Conference, Belfast To launch Donate Your Data (the forerunner to use MY data). To explain the concept, obtain the reactions and help of patients to develop the idea and sign up members.